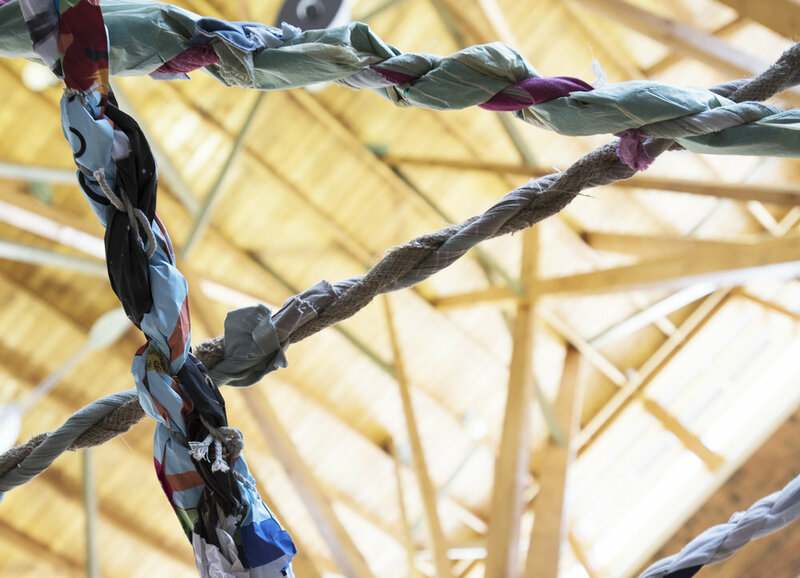 Site-specific and temporary in nature, these projects are a response to a particular space and set of issues. They range from indoor to outdoor and evolve out of their setting. 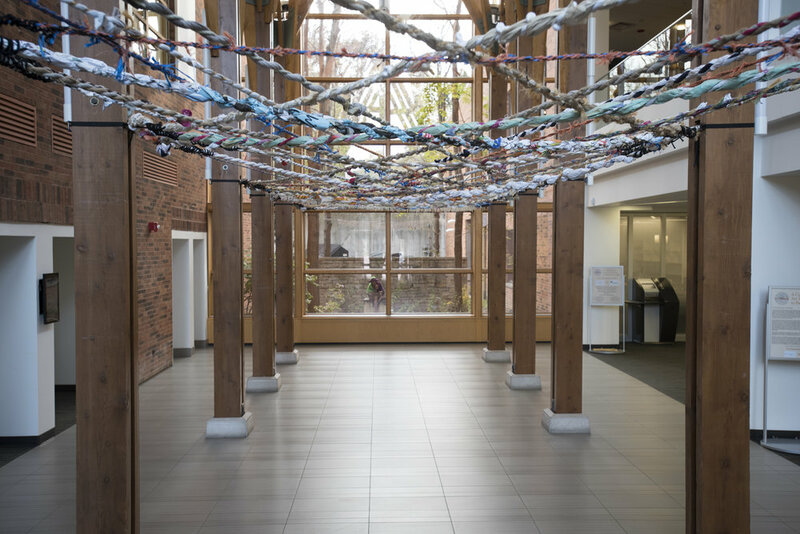 Ropes made from repurposed materials by members of the library community in a series of eight workshops span a space between 12 columns in the atrium library (approximately 49’ x 13’) . Barrington Area Library, Barrington, IL. The project was co-sponsored by the Library and Barlett Tree Experts, and organized by Christine Esposito at Terracom. 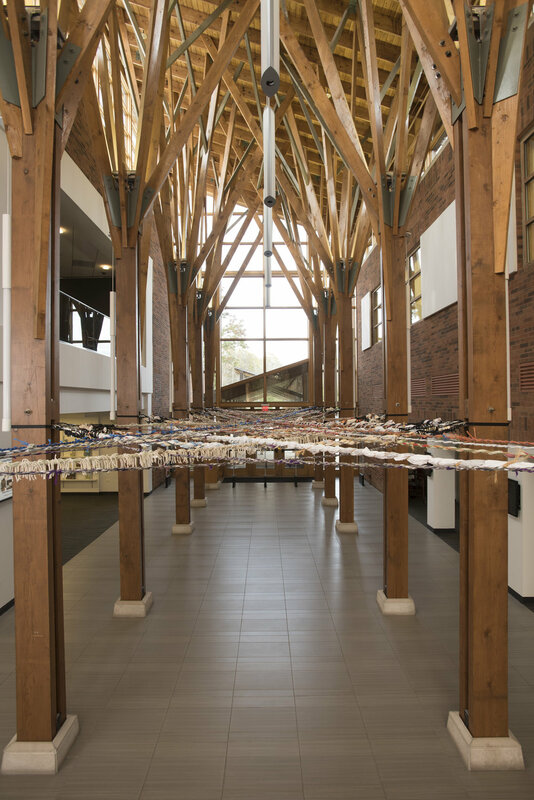 The branched wooden columns of the Barrington Library’s soaring atrium generated a strong reference to the hallowed space of a forest, as well as to Peter Wholleben's book The HiddenLife of Trees. The book reveals what we cannot see: that is, how trees within ancient forests function as a unit as they communicate through beneficial fungi living symbiotically at the root tips. 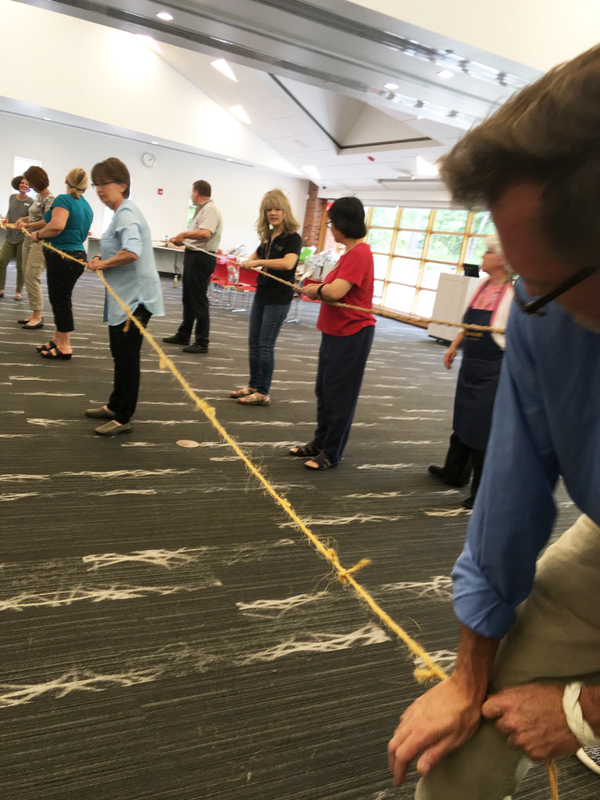 In a similar way, a library develops a mutually beneficial relationship with its community. Both the library and the interconnected root systems of trees compete for resources within their own community or environment. Ultimately, each of these systems works together as an organism for survival, providing us with a model for sustainable human culture. Network is an embodiment of these ideas. Folded Tyvek Installation (14’ x 14’ x 7’); Halsted Street, Pilsen neighborhood, Chicago, IL. to make a compact form out of something voluminous and to create three-dimensional structure from a flat plane of material. 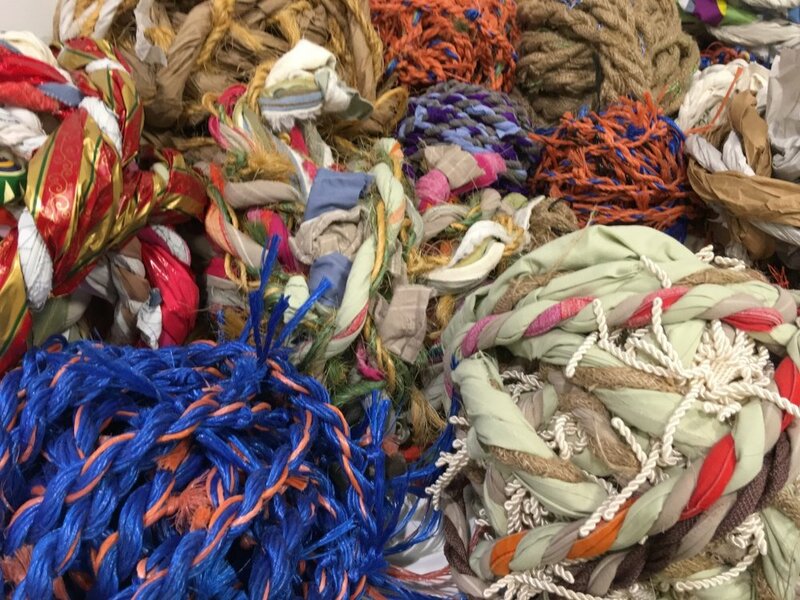 Folded Terrain, a temporary installation in a storefront window in Pilsen’s historic neighborhood, was an opportunity to explore work–in-progress for ASCENDance where the structures existed on their own without movement. During an evening performance, dancers performed in the window installation activating the space. 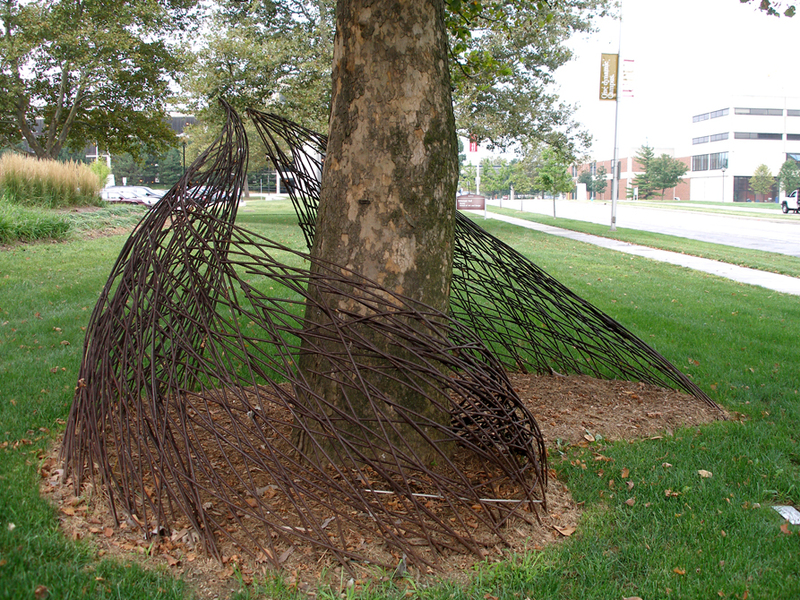 Welded steel structure (7’ x 20’ x 10’); Herron School of Art, Indianapolis, IN. 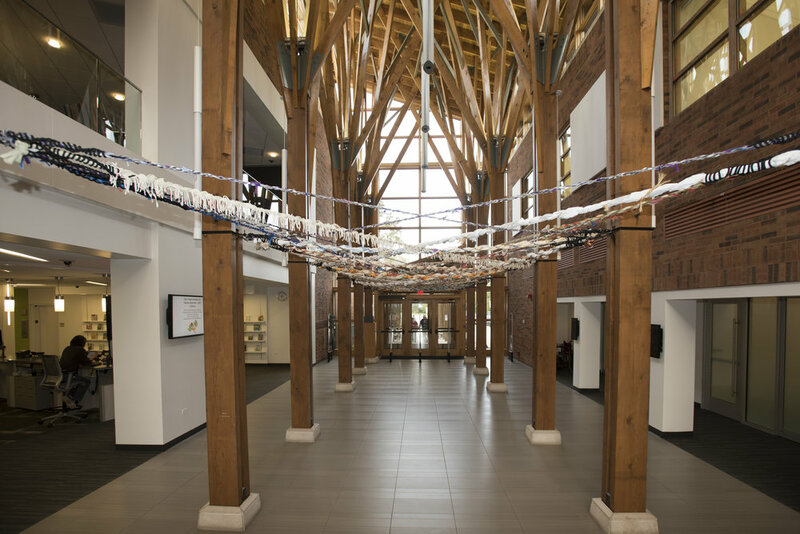 Split Sycamore, installed on the new campus of the Herron School of Art, emerged from a wide split in the trunk of a sycamore tree located in front of the building. 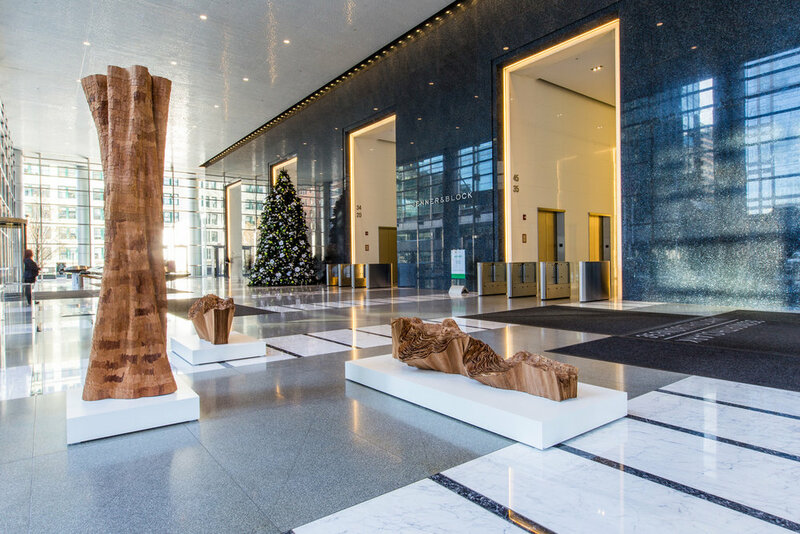 As the name implies, it was intended to embody the energy of the tree and activate a space around it. As the larger section of two welded-steel forms spiraled out of the split, a smaller section countered that movement, spiraling out in a different direction and on a different axis. Two welded steel structures (7’ x 25’ ea. ); 55th Street and Martin Luther King, Jr. Boulevard, Chicago, IL. 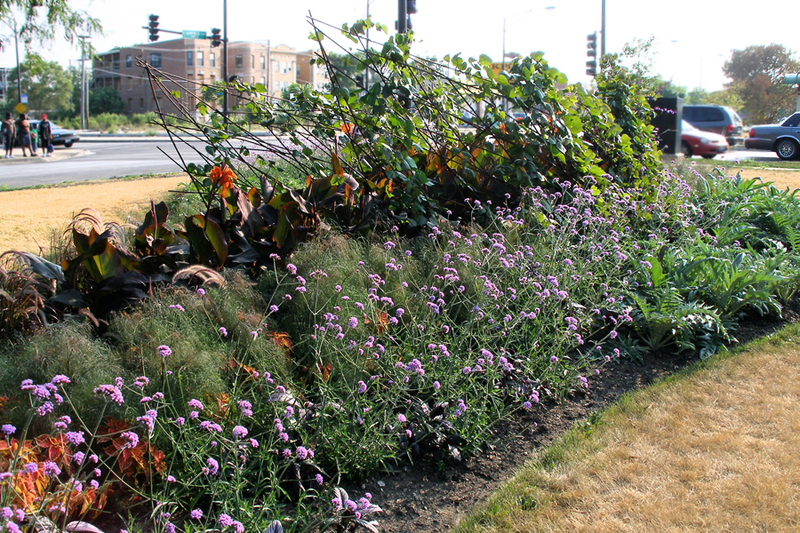 Wave is a site-specific installation for the City of Chicago’s Park District for the purpose of creating structures and plantings to interact with each other on two pre-existing kidney shaped, annual flowerbeds, each 70 feet long in the median at 55th Street and Martin Luther King, Jr. Boulevard. The median is an island viewed from a distance, either by car from the street or while crossing the street by foot. The forms of the plantings derived from ebb and flow patterns in water. 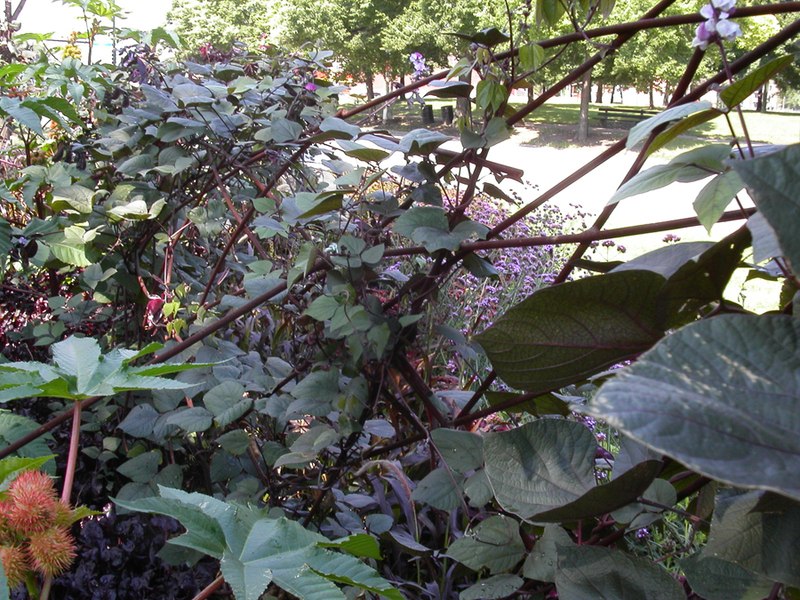 Rhythm and punctuation came from altering the height and texture of the plants. Movement occurred both within the beds, as well as through the season, as the plants grew and developed. Two pairs of curved steel trellises were built and anchored in the beds, their structure evolving from forms of waves. 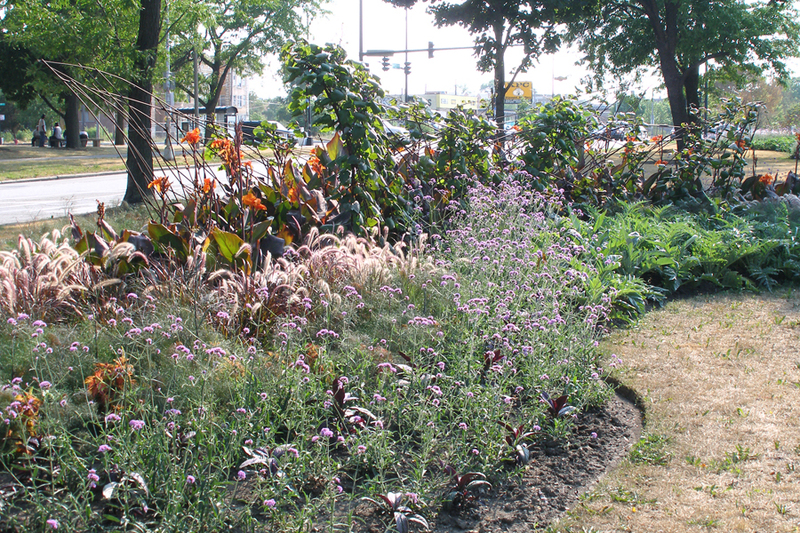 The curves emphasized the flow of traffic around the median and echoed the shape of the planted beds. Plantings were designed to emerge out of (and, ultimately, to cover) the steel structures in the summer. When the plants died back in the winter, the trellis structures floated on the surface of the ground like interlaced branches.